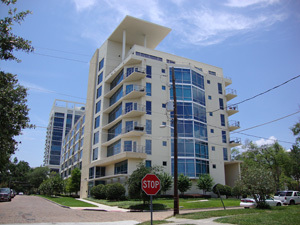 A unit at Thornton Park’s popular “The Jackson” on Jackson Street in Orlando downtown was just listed! At an unbelievable price of $152,000 this 2 bedroom, 2 bathroom bank owned condo with private balcony won’t last long! The unit had originally sold for $350,900 in 2006 (when it was built)! If you have been dreaming of living the urban life in downtown Orlando you should definitely consider this huge opportunity to live in a newer condo that was originally built as condo, not converted from an apartment complex! Needless to say, the location is prime! Contact us at 407-340-6458 to set up a showing or send us a quick message and we’ll be in touch shortly! 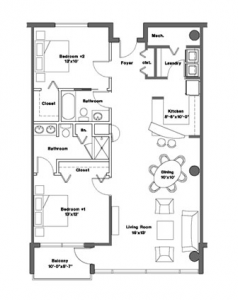 Flooplan of UnitWe had recently shown a unit here with the same floor plan that was listed at $200,000. This floor plan boasts 10′ ceilings and expansive windows overlooking Thornton Park. Even though it needed major repairs I thought it was an excellent price. This condo however, is even better – also because it is bank owned and NOT a short sale! Thornton Park, that means brick paved, oak lined streets in the heart of downtown Orlando. Living in Thornton Park you will be surrounded by charming, uniquely restored historic homes, trendy lofts and cozy bungalows and town homes. Walk to popular Lake Eola for the weekly Farmer’s Market or ride your bicycle to the public library or one of the many stores and restaurants for a spontaneous brunch with your friends. Soak in some culture at the amphitheater in Eola Park during Spring’s UCF Shakespeare Festival. Thornton Park offers parks, walkways, jogging paths and romantic scenery that is hard to find anywhere else in Central Florida. At the same time, enjoy the luxury to be in the center of City Beautiful – walk to work or to the club! See and be seen – Thornton Park is Orlando’s South Beach! In case this is not the right (bank owned) condo for you, there are more!! 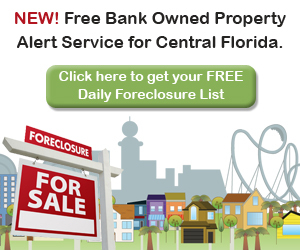 Check out the Search Homes link on the top of this page (in case you only want to look for foreclosures be sure to check the “just bank/lender owned” checkbox before you use the map search). This will bring up all the bank owned homes in the Lake Mary and Sanford area, or any other area you specify! This is a unique, new search feature that you won’t find on other sites, so be sure to take advantage of it! No registration required and free RSS or Email updates for your searches are available! This downtown Orlando condo real estate listing is courtesy Harp Realty Inc.